﻿ The Hotel Nova, Mandalay | FROM $27 - SAVE ON AGODA! "The Hotel Nova is a great place to stay!" Have a question for The Hotel Nova? "The staff is extremely accommodating and kind, always willing to help when they can." "Staff were also willing to go above and beyond to help with our requests such as purchasing phone cards, calling for taxis etc." "Breakfast was also decent on the rooftop restaurant." "The room was very clean and spacious." When visiting Mandalay, you'll feel right at home at The Hotel Nova, which offers quality accommodation and great service. The city center is merely away and the airport can be reached within minutes. With its convenient location, the hotel offers easy access to the city's must-see destinations. At The Hotel Nova, every effort is made to make guests feel comfortable. To do so, the hotel provides the best in services and amenities. This hotel offers numerous on-site facilities to satisfy even the most discerning guest. In addition, all guestrooms feature a variety of comforts. Many rooms even provide television LCD/plasma screen, clothes rack, linens, mirror, slippers to please the most discerning guest. Whether you're a fitness enthusiast or are just looking for a way to unwind after a hard day, you will be entertained by top-class recreational facilities such as hot tub, fitness center. 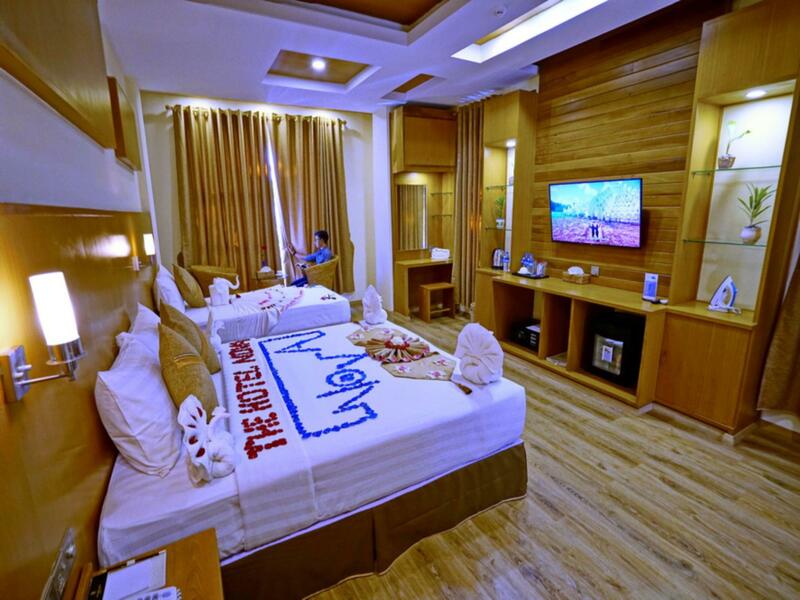 Whatever your purpose of visit, The Hotel Nova is an excellent choice for your stay in Mandalay. "The staff were incredibly friendly and accommodating." There is no shower cubicle or shower curtain so your whole bathroom floor ends up wet. Other than that, it’s a pretty good hotel. And they have a free marionette puppet show every evening. This is an ok hotel, staff were helpful but given the wide choice of options in Mandalay you may be able to find better for a similar price. Stayed for almost 10 days in total at this hotel. 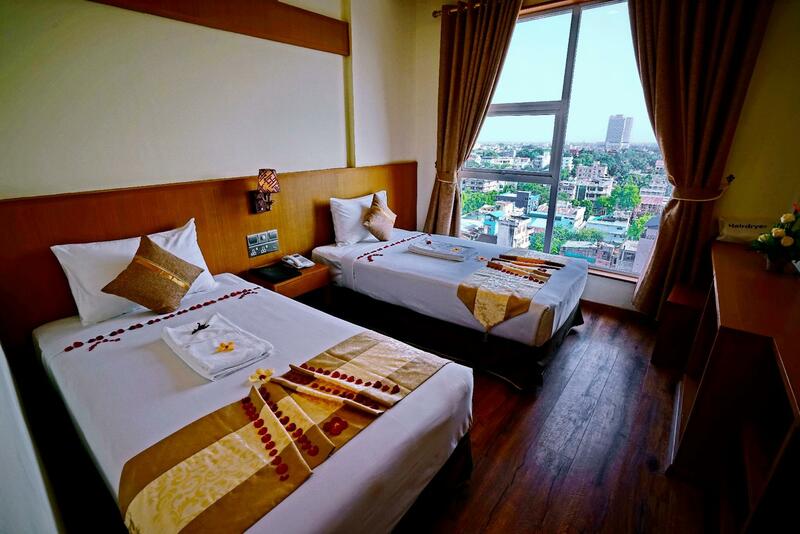 We were given one of the corner top rooms which had excellent views of mandalay city through the huge windows. Staff were also willing to go above and beyond to help with our requests such as purchasing phone cards, calling for taxis etc. Breakfast was also decent on the rooftop restaurant. Would have loved to stay longterm in this hotel. Only downside was that the sealant on the windows were not very good, thus the water seeped into the room whenever it rained. Hopefully they've fixed that by now. Dear Fong, Greetings from The Hotel Nova, We are very happy to hear such a tremendous positive feedback from you and also look into the matter that you have suggested. All of our staffs are very happy to hear that you had a great stay in Mandalay. Please do come next time and we look forward to seeing you as our very special guests.Simon(Mr.)Sales and Marketing. Dear Zayar, Greetings from The Hotel Nova, We firstly would like to thank you for choosing our hotel and also leaving a very lovely and high scoring marks for us which is very helpful. All of us are very happy to hear that you enjoyed your stay with us in Mandalay and we believe we will keep on pushing hard on our service quality and nailing every steps in details. Please do come next time and we hope to see you as our very special guests. Simon(Mr.) Sales and Marketing. clean and big room, lots of buffet breakfast line. but a lil bit too far from restaurants and attractions, its near a fresh market. Dear Tippaya, Greetings from The Hotel Nova, Thank you very much for choosing our hotel for your stay in Mandalay and we are honored to have you as our guests. All of our staffs are very happy to hear that you had a wonderful stay here. We will try to carry on improving our service quality better and also try to arrange more modes of transportation for visit around the city. Please do come next time and we will be looking forward to seeing you as our VIP guests.Simon(Mr.)Sales and Marketing. We arrived and we saw our names written on a chalkboard. The staff were incredibly friendly and accommodating. We watched the free puppet and xylophone show on the top floor while eating tea leaf salad. The room was very clean and spacious. The internet was fast, the water was hot, and the beds were comfy. The only negative was that the walls were a bit thin. Overall, I would definitely recommend the hotel to others . Dear Eric, Greetings from The Hotel Nova, Thank you very much for choosing our hotel for your accommodation. We all are very happy to hear that you enjoyed your stay with us and also point out our strength and weakness which is very helpful for us. We will definitely look into the matter that you have mentioned. Please do come next time to Mandalay and hope to see you again. Simon(Mr.) Sales and Marketing. I don’t know the other room but the smell of the one in the basement is nasty. It’s strange that no one mentions this in the review but it can be smell in the balcony so that it’s not the smell of one room. Dear Thi, Greetings from The Hotel Nova, Thank you for choosing our hotel for your stay in Mandalay. We are very sorry about the smell problem and we are very ashamed of that. We also took care of that problem and now it seemed it has sorted out. Thank you for mentioning our weak point and we will try not to happen again. Please do come next time and we hope to see you as our VIP guest. Simon (Mr.)Sales and Marketing. 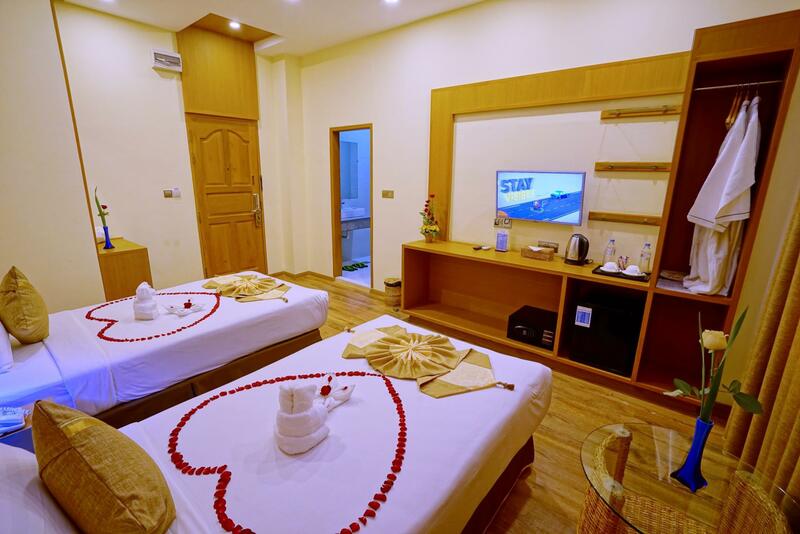 Excellent staff, clean rooms, wonderful view from rooftop restaurant. Just a little far from the Royal Palace but you would probably take a taxi anyway. Highly recommend the hotel. Reasonable prices on transportation and tours as well. Overall excellent. It was in a good location lots to do around the area , the staff were helpful and room was clean , it would have been a full marks if had been put in the room we payed for must have given our room away. The next day we did end up moving but only because really bad smell in room . The second room was good can't complain. Would recommend this hotel . Dear Our Valuable Guest , Mingalarbar, Warmest Greeting from The Hotel Nova, All of us are very happy and pleased to hear that you enjoyed your stay with us and for your wonderful review on the one of world's largest traveling website with a full marked lovely caption " Perfect Stay to discover Mandalay " . Our team would love to read that you praised our service. Thank you very much for your wonderful review and we hope to seeing you nearest future and serve the best service for you again. Thanks and Best Regards, Khaing Zaw Oo (Mr.) Sale and Marketing. The Hotel Nova (Mandalay). New hotel located a few mins from the Grand Palace and near the local markets. The building is very luxurious with a great view of the city from the upper floor rooms. Breakfast buffet was also a win-win. Would highly recommend! Fantastic staff. Great food. Excellent housekeeping. Not so fast Wifi but works. Tasty breakfast. Great city views. We will be back next week! Very annoying and unhelpful tour taxi driver who apparently works exclusively for the hotel. You would much much better off grabbing one off the street yourself. I saw no benefit of using the services of the guy whom the front desk staff directed me to. We were planning on taking a night bus and not spending a night in Mandalay but there weren't any buses that suited our schedule so booked the hotel last minute. The staff is incredibly nice and the place is so clean! We even enjoyed a puppet show and xylophone show at night with dinner! It was an overall pleasant stay! Dear our valuable guest, warmest greetings from The Hotel Nova. Thank you very much for your lovely review with a wonderful score point. We are so happy that your expectations meet reality because we are still in working progress as the hotel is quite new .Thanks a Lot to recommend to our Hotel. We are looking forwards to serve you in the near future. Thanks and Best Regards, Nyein Chan Zaw (Mr.) Assistant Front Office Manager. The Hotel Nova, Mandalay. The receptionist is very helpful. Hotel buffet is good too. Dear our valuable guest, We are so pleased to read that we have met your expectations and you were very happy with our facilities and services and your super review on our staff. We are looking forwards to serve you in the near future. Thanks and Best Regards, Nyein Chan Zaw (Mr.) Assistant Front Office Manager. The Hotel Nova, Mandalay. We were very impressed with the facilities: they were clean, tasteful and inviting. The staff were acconodating on more than one occasion. We also enjoyed the bicycles, complimentary cocktail and puppet show - not to be missed!! Dear our valuable guests, warmest greetings from The Hotel Nova. Thank you very much for your lovely review with a wonderful heading “Delightful and clean stay in a great location”. We are so pleased to read that we have met your expectations and you were very happy with our facilities and services and your super review on our staff. Thanks a Lot to recommend to our Hotel. We are looking forwards to serve you in the near future. Thanks and Best Regards, Nyein Chan Zaw (Mr.) Assistant Front Office Manager. The Hotel Nova, Mandalay. Buen hotel un poco alejado. Desayuno buffet bueno y piezas amplias y limpias. Staff no sabe mucho ingles y ofrecen los tours con precios excesivos. En general, muy bueno. Lo volvería a elegir. Íbamos para dos noche y nos quedamos tres. Alquilan motos para recorrer la ciudad y alrededores.